Real-estate firm Equity Residential hopes to start construction on the 15-story apartment building next year. The new structure’s footprint would be some 70 feet north of the cathedral itself, replacing large metal sheds and parking spaces in the area now. Church officials maintain that completing its “real-estate initiative”—as they call an apartment building already open at the southeast corner of the cathedral property as well as plans for another one on the north side—are an economic necessity to provide revenue for the cash-strapped cathedral. The real-estate income “has a huge impact on our capacity both to operate the cathedral, maintain our mission and, really importantly, do the work we need to do on the cathedral building itself,” said Stephen Facey, the cathedral’s executive vice president. Now that the real-estate initiative is almost complete, he said the cathedral could renew discussion about landmark status for the cathedral and the rest of its grounds. In 2003, the commission decided it was time. It also decided to remove the campus’s two future building sites from landmark consideration to help the cathedral raise enough money to pay for repairs. Though the cathedral endorsed the commission’s decision, some neighbors, led by then-City Council member Bill Perkins, objected. They argued that designating the cathedral a landmark while keeping sites on its campus open to development was inadequate. “If the cathedral and the close deserve to be protected as landmarked, then why did the city exempt two elements of the landmark?” said Michael Henry Adams, an aide to Mr. Perkins, now a state senator. 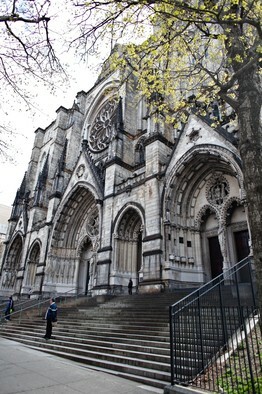 Mr. Perkins persuaded his colleagues to unanimously reject the commission’s proposal for St. John the Divine, a power little used by the council. Mayor Michael Bloomberg vetoed the council’s rejection, but the council overrode this as well, a vote even rarer than overturning the commission’s initial plan. The moves and countermoves left the cathedral still without landmark protection, and the commission hasn’t taken any major steps toward landmarking the cathedral or its campus since 2003. But the commission now is “actively reviewing the timeline for designating the important historic resources at the site,” according to landmarks spokeswoman Elisabeth de Bourbon. Cathedral officials have set certain restrictions for the new building, including holding the new development’s height to about 145 feet—the same as the eave line of the cathedral—and protecting certain street views of the cathedral. Overall, Dean Kowalski said he supports landmarking St. John the Divine. “I think having the cathedral landmarked just clarifies what most people think anyway,” he said. Mr. Perkins said he is willing to work with cathedral officials on alternative ways for them to meet their financial needs, but he hasn’t changed his stance since 2003 on wanting the entire campus landmarked. “My position today is basically the same,” he said recently.